In the early years of the 20th century, the international scene was one of national and empirical tensions. The great powers of France, Germany, Russia and Great Britain were vying with each other for power not only in Europe but in Africa and Asia. The moribund Austro-Hungarian Empire and the Ottoman Empire were facing internal collapse as smaller nations within their borders, especially in the Balkan region, were demanding self-determination. The Austro-Hungarians had a military presence in Bosnia-Herzogovina since 1875 and in 1908 they fully annexed it into the empire thereby angering Serbia which also claimed the province. The world was sitting on a tinderbox and the spark that ignited it came at Sarajevo on 28th June 1914 when Serbian student, Gavrilo Princip, shot and killed Archduke Franz Ferdinand, heir to the throne, and his wife Sofia. Princip was a member of the Black Hand organisation headed by Colonel Dragutin Dimitrijevic of the Serbian military intelligence. The Austro-Hungarians, backed by Germany, issued a set of conditions upon the Serbs effectively taking away their independence. In return, the Serbians appealed to the Russian Tsar for help. The Austro-Hungarians declared war on 28th July. This was followed on 1st of August by Germany declaring war on Russia. France was committed by treaty to come to the aid of Russia and Germany recognising this declared war on France on 3rd of August. The Germans immediately attacked France by invading Belgium. Great Britain was by a treaty signed in 1839, honour bound to protect the independence of Belgium and thereby declared war on Germany on the 4th of August. In Ireland, the situation was also fraught with danger. A 3rd Home Rule Bill had finally been passed in January 1913 but it was not acceptable to the Protestants of Ulster. Fearing a loss of status in an independent Irish Kingdom dominated by Catholicism they demanded that Derry, Down, Armagh and Antrim be excluded. These were the counties in which they were the majority. The Protestants, led by Sir Edward Carson and James Craig, had been busy organising protests, signing a covenant, and in 1913 forming a militia which they named the Ulster Volunteer Force. They threatened to use force to preserve their own link with the United Kingdom and to do this they started to import arms. In April 1914, at Bangor and Larne, they managed to take in a consignment of 24,600 rifles and 3 million rounds of ammunition bought from Germany. 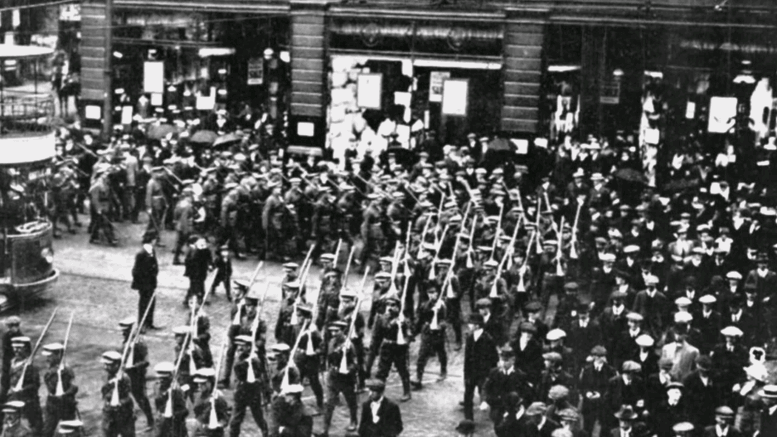 The UVF by this time had a membership of around 100,000 men. Many of their officers were ex-soldiers and they also carried a great deal of sympathy from serving officers on the British Army. The Nationalists, startled by the militarism of the Ulster Protestants, formed their own militia, The Irish Volunteers and by May 1914 they had around 40,000 members, drawn mostly from the GAA, the Gaelic League and Sinn Féin. They also attempted to buy arms from Germany. The British fearing a civil war were hesitant to implement the Home Rule Bill and as hostilities broke out with Germany, the bill was delayed until the war was ended. With the outbreak of war, Craig and Carson immediately offered the use of the U.V.F. to the war effort. This was accepted by the British and the UVF, in its entirety, entered into the 36th (Ulster) Division. On the nationalist side, though disappointed that the Home Rule Bill had been delayed, the parliamentarian John Redmond also offered the services of the Irish Volunteers. He hoped that the Volunteers, standing shoulder to shoulder with the UVF in defence of the Empire, would help meld together both sides of the Irish people. However the British sneeringly refused him. Redmond campaigned for Irish Catholics to enlist and fight for the British and very many did. However, there were many who disagreed with him and so a split developed within the ranks of the volunteers. In September 1914 after a speech by Redmond at Woodenbridge, a majority of volunteers chose to follow Redmond and they were to become known as The National Volunteers. These men are thought to have numbered about 170,000 and a great many of them were to see action in the trenches of the western front. They were denied the right to form their own regiment by Kitchener. Modern Ireland 1600-1972. By R.F. Foster. Penguin Books. London. 1989 edition. A History of Ulster. By Jonathan Bardon. The Blackstaff Press. Belfast. 2007 edition. The First World War, an Illustrated History. By A.J.P. Taylor. Penguin Books. London. 1966. 1914-1918. The History Of The First World War. By David Stevenson. Penguin Books. London. 2004.